Easy croissants? Is there such a thing? There is nothing in the world like fresh, homemade croissants but they can be intimidating and time consuming to most people. Not these! 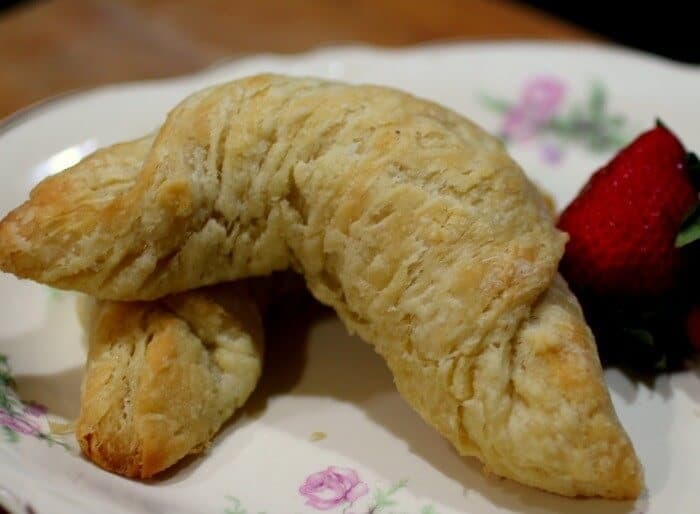 This croissant recipe is straightforward, only takes 45 minutes to put together and anyone can do it — especially with the tips and tricks I am going to give you. The first real cookbook I ever got was in 1980, shortly after marriage. It was called The Creative Cooking Course and I had no idea that my first cookbook was written for intermediate cooks not novices like I was. It was filled with things I had never heard of like kugelhopf, making your own ravioli (you can do that? ), and croissants. All of my cookbooks to that point were vintage and antique. I could cook your basic 1940s American cuisine just fine, thank you very much. Bread was no problem for me, I had been making it since I saw a recipe in a Seventeen magazine when I was fourteen. Tuna casserole, meatloaf, and roast chicken were all within my ability but this book opened up a world of European techniques that I was unaware of. Croissants were some of the first things I tried. This is an adaption of that recipe. Now, most croissant recipes are time consuming but this isn’t at all. You’ll work on the dough for 45 minutes, let it chill for at least 45 minutes, and then cut them, let them rise overnight, and bake them in the morning. Super simple. SUPER impressive. 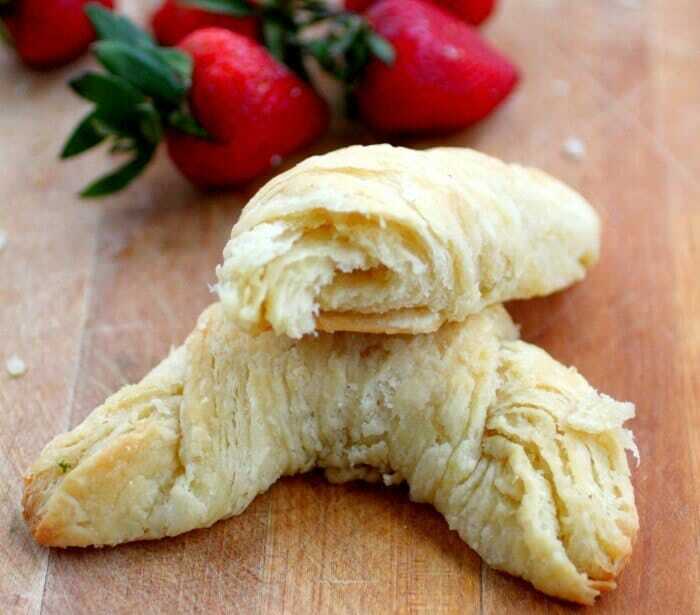 Super easy croissants. Always use real, unsalted butter. The higher quality the butter the better the result. Plugra is excellent. Follow instructions to the letter. You can’t reroll the dough once it’s cut. Bake trimmings as garnish for soups and salads. Don’t roll over the edges of the dough. It will split them open and the butter will ooze out. Use a rocking motion to roll out the dough, not a rolling one. Put the rolling pin down, rock, lift, repeat. The dough will roll out with waves in it. Keep everything cold. If the butter warms up it will ooze out and ruin your croissants. If the butter breaks through a little just patch it with some flour. If the room is warm either turn the air conditioning down or wait until you have a cooler day. The easiest way I have found to cut the triangle is to cut squares and then cut each square from corner to corner. You’ll have four big croissants from each square — this recipe makes 12 big ones or you can make 24 smaller. Let them rise in the fridge unless it is winter and your kitchen is chilly. The secret to good croissants is to keep everything chilled. You can hold the dough in the fridge for up to 24 hours or you can freeze the shaped croissants OR you can bake them and then freeze them. Once they are baked they are best fresh. Here are the steps. I am sorry about the images – we’ve had rainy, cloudy days, I’m using a new camera, and I can’t find my studio lights. (whine, whine, whine). Hopefully you can at least get an idea of how the steps look. As always, if you run into a problem message me on the Facebook page. Keep in mind, by making them quicker and easier you do lose a little of that super flaky texture but the buttery flavor is definitely there. Although these flaky croissants must rise overnight in the refrigerator there is only 45 minutes of actual prep time. Who doesn’t love fresh croissants for breakfast? 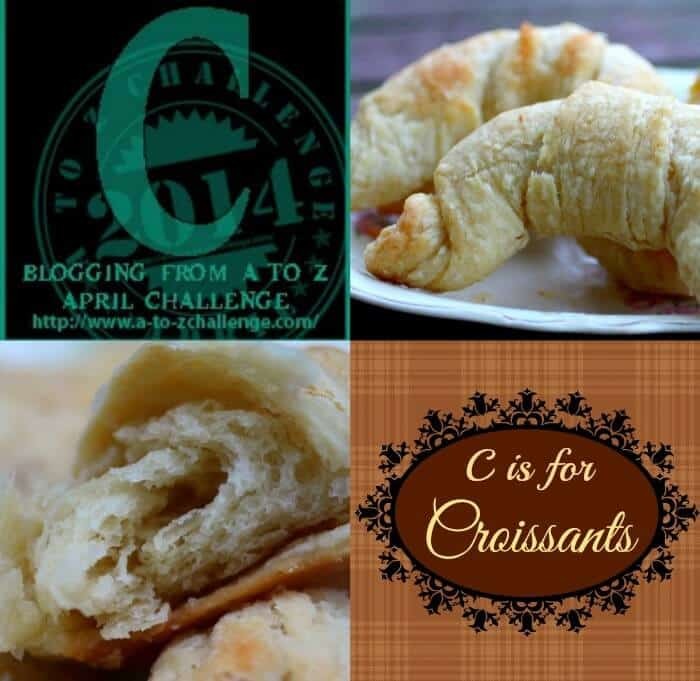 This recipe is a simplified croissant recipe and, by following the tips in the blog post, a novice baker can easily make those oh-so-impressive croissants. Cut the flour into the butter until it is well mixed. Shape the butter mixture into a 1/4 inch thick rectangle on a sheet of waxed paper. Cover with waxed paper and chill while preparing the dough. Place the yeast and sugar in a bowl. Add the water and stir until well mixed. Set aside for five minutes and let foam. With the mixer running add the flour, a little at a time, until the dough pullss away rom he sides of the bowl. Knead for 5 minutes by mixer or 10 by hand. Throw the ball of dough down onto a counter from 20 inches up. Repeat about 50 times, reforming the ball as necessary. The last time you throw it down watch carefully – it will expand and contract. That means it’s ready. Roll the dough out on a lightly floured board into a 15×17 inch rectangle. Place the chilled butter in the middle of the rectangle. Begin folding the dough with the short end nearest you. Fold to the center. Bring the opposite end over the center. Now fold the sides over the center. Turn the dough over so the folds are underneath. Using a gentle rocking motion to roll dough. Do not roll over the edges. 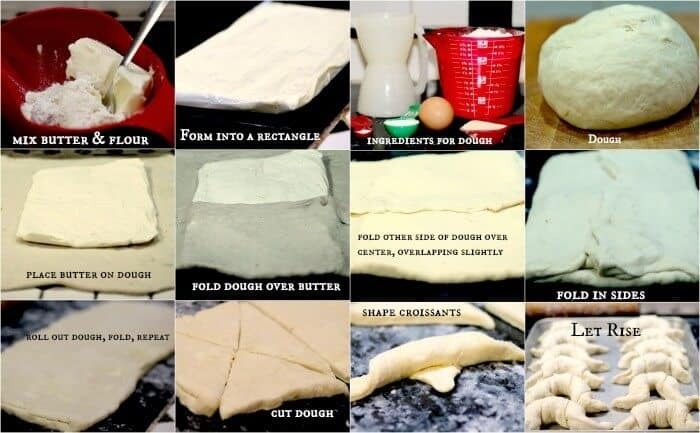 Fold the dough as before. Give it a half turn. If the butter starts to ooze out put it in the fridge for a few minutes. After you’ve rolled it out the last time cover and chill it for 45 minutes. Cut 2 even triangles from the dough. Wet each tip with a little water. Roll up from the wide end to the tip and form into a crescent. Cover with plastic wrap and let rise in the refrigerator overnight. If you are in a hurry and your kitchen is relatively cool you can let them rise about 30 minutes on the counter. Next day bake at 400F for 15 to 20 minutes. You mentioned mixing the dough 5 minutes with mixer, or 10 minutes by hand. I have a Kitchen Aid mixer. Do I use the paddle attachment or the dough hooks? You would need to mix it according to manufacturer’s instructions – I am guessing the hook? These were an absolute slam dunk for me, and I’m the sort of person who can easily ruin bread. They’re fantastic! Thank you so much for the step-by-step, clear, detailed instructions. I’m off to look at your other recipes! Mary, I absolutely LOVE croissants. I’m going to try your recipe out….perhaps when the boys are here for a visit end of September! Sounds good… let me know what you think! YUM! I love how simple these are and how delicious they look! They are buttery for sure! Great tips… makes it seem like it’s doable for any skill level! 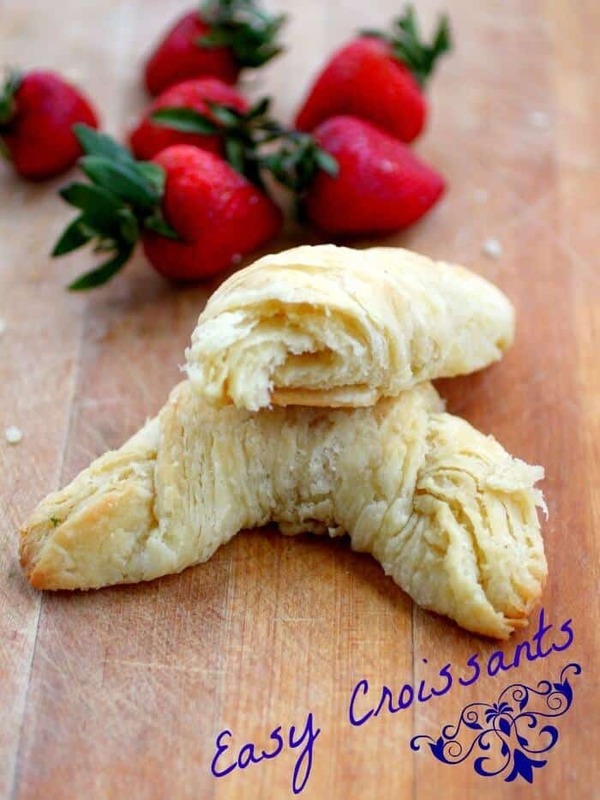 I love a croissant, so I’m hoping to try these soon! I think they are. let me know how they come out. Thanks! I love croissants.. maybe a little too much. Those look great Marye! Shared in the recipe events in Cookbook Junkies. Thanks! They are great when you’re in a hurry! Yummy! Came to get your Snickerdoodle with spice added to make today! 🙂 I love those.. enjoy! What size is the butter trctangle? Is it 15 x 17 same as the dough? Thanks! I’d really like to try making these as soon as I know about sizes. No, it’s about 1/3 the size of the dough. LOL! Yep. I love homemade croissants… Thanks for stopping by. Thank you for your generosity in providing not only this easy-to-use recipe but also the helpful tips. And the photos of the final product are mouth-watering! When I get home from my travels I intend to make these and will let you know how they turn out. I don’t think I’ll have any problem following your last tip–to make sure that they’re eaten fresh! Cruel woman…now I’m craving croissants….and I’m making them soon. Thanks Marye!